Hey everyone: on this day 36 years ago (that’s Oct. 10, 1981 for those who don’t want to do the math), Chef Jim Smailer joined The Cork family and helped establish our restaurant as one of Boulder’s favorite fine dining traditions. 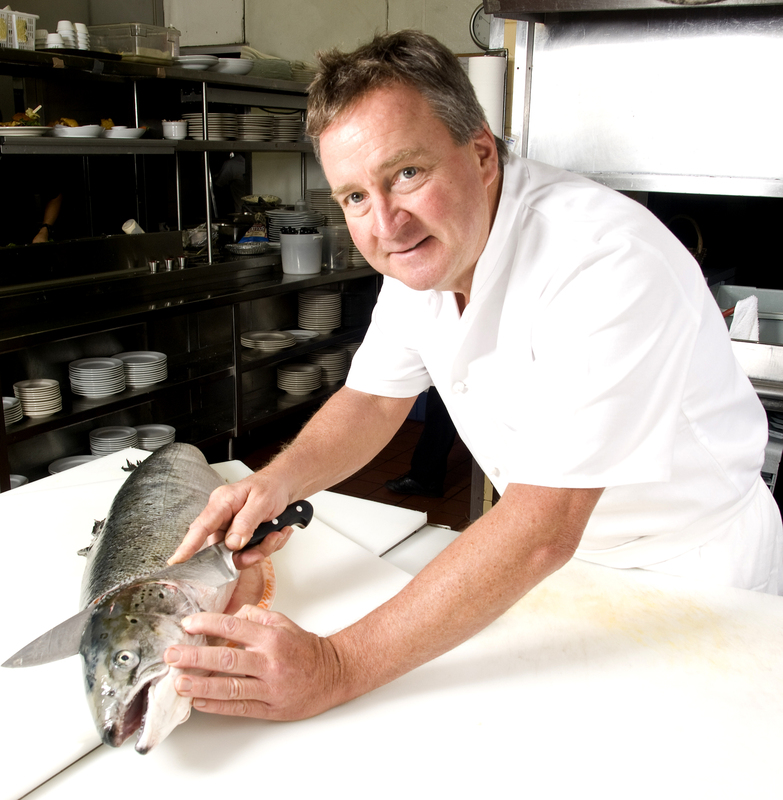 While The Cork is known and beloved for its perfectly prepared steaks, those who have had Chef Jim’s famous fish tacos, crab cakes and Sake Salmon can taste that Chef Jim’s one true love is seafood. 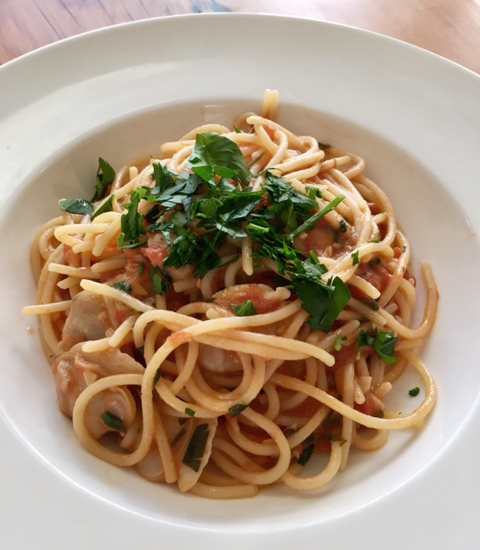 So in honor of Chef Jim’s 36th anniversary at The Cork, and his love for seafood, we wanted to share with you one of Chef Jim’s all-time favorite recipes: linguine with clam sauce. I love this dish! This recipe appears simple but requires lots of attention to detail. Follow the timing of each step as outlined in the directions exactly to ensure you get a nice, thick, flavorful clam sauce. I recommend getting your clams from Whole Foods if possible. And be sure to serve this dish with homemade garlic bread and plenty of red wine! Good luck, and let me know how it turns out—questions and comments welcome below! In a large sauce pan with a tight fitting lid, combine clams, ¼ cup of olive oil and 1 tbsp of the garlic and cook over medium heat, shaking pan occasionally. After approx. 5 min., add wine and allow clams to simmer until they open. Remove the open clams from the cooking liquid, move to a bowl and let cool. Strain the cooking liquid through a fine strainer or cheese cloth into a sauce pan. Remove clams from their shells and set aside. Heat remaining ¼ cup of olive oil over medium heat in a large sauté pan. Add remaining 1 tbsp of garlic and cook until fragrant. Add red pepper flakes and stir in the chopped tomatoes. Cook this mixture for 5–8 min. Heat the reserved clam broth over medium heat. Using a small ladle add about 2 ounces of clam liquid to the simmering tomato mixture. Repeat this 3 times, letting the liquid reduce a little each time until you have a thick, flavorful sauce. Bring a large pasta pot of water to a boil. Salt the pasta water and add pasta. Cook pasta according to directions on the pasta box. Meanwhile, pour the remaining clam broth into the tomato mixture and bring to a simmer. When the pasta has 4 min. of cooking time left, strain the pasta and add to the tomato mixture. Finish cooking the pasta in the sauce until al dente. Add the clams and ½ of the parsley. Toss all together to warm. Serve in warm pasta bowls and garnish with remaining parsley.